Paul Davids is from Bethesda, Maryland, the son of a famous Georgetown University professor of American History, Dr. Jules Davids. Dr. Davids worked extensively with John F. Kennedy on the writing of PROFILES IN COURAGE (for which he is credited in the Preface). Jules Davids was a professor to Jacqueline Kennedy and later to Georgetown undergraduate Bill Clinton. Paul Davids is a graduate of Princeton University, where he majored in psychology and won numerous awards in writing. He then attended the American Film Institute Center for Advanced Film Studies in Beverly Hills. He is married to Hollace Davids, who is Senior Vice-President of Special Projects for Universal Pictures and who has produced several of his films. After a few years working as a script analyst for Hollywood agent Paul Kohner (where he read all the submissions for Charles Bronson, John Huston and even William Wyler), his career in film and television took off when he got his “first break” as production coordinator (and a writer) of the original “TRANSFORMERS” TV show for Marvel Productions. He co-wrote (with Hollace Davids) THE FIRES OF PELE: MARK TWAIN’S LEGENDARY LOST JOURNAL and the husband and wife team co-wrote six STAR WARS sequel novels for Lucasfilm and Bantam books, including the award-winning MISSION FROM MOUNT YODA plus THE GLOVE OF DARTH VADER, THE LOST CITY OF THE JEDI, ZORBA THE HUTT’S REVENGE, QUEEN OF THE EMPIRE and PROPHETS OF THE DARK SIDE. The books sold millions of copies and were published in many languages. Hollace Davids produced MARILYN MONROE DECLASSIFIED with Paul Davids. Her other recent producing credit was THE LIFE AFTER DEATH PROJECT (2013). She served as associate producer of the Paul Davids documentary TIMOTHY LEARY'S DEAD. She produced with Paul the independent feature film, STARRY NIGHT, which was released on Universal Home Video and was featured at the Montreal, Boston, Sun Valley and AFI Film Festivals, winning the Audience Choice Award for Feature Film at the Newport Beach Film Festival, and which has shown on television around the world. She produced Paul Davids' feature documentary, THE ARTIST & THE SHAMAN, whiich was released on DVD and played at Film Festivals including the Art Film Festival in Slovakia and the Sedona Film Festival. She was producer of Paul's documentary feature THE SCI-FI BOYS hosted by Peter Jackson with appearances by the greats of the genre Steven Spielberg, George Lucas, Forrest J Ackerman, Ray Harryhausen, John Landis, Roger Corman, Rick Baker and Dennis Muren. THE SCI-FI BOYS was honored with a Saturn Award for Best Original DVD and won the Rondo Award and was released on Universal Home Entertainment, aired on the Sci-Fi Channel (Syfy) and has been seen around the world on television. She also recently served as executive producer of BEFORE WE SAY GOODBYE. Currently, she serves as Senior Vice President of Special Projects at Universal Pictures in the Feature Marketing Department. She is responsible for planning and implementing all Universal Premieres for the motion pictures, working on the Academy Awards campaigns as well as film festivals including the recent premieres of JURASSIC WORLD, PITCH PERFECT 2, FURIOUS 7, MINIONS, TED 2 and TRAIN WRECK. Hollace has spent most of her career planning and executing events from premieres, retreats, award ceremonies, film festivals and studio events. In 2007, she was named to the Inaugural Group of Biz Bash Hall of Fame. Hollace served for three years (from 2000 to 2003) as the President of Women in Film (Los Angeles), the non-profit organization founded in 1973 with over 2,400 members both men and women in the entertainment industry. She currently serves on the Women in Film Foundation Board and is a member of the Marketing Committee. She also served as Vice President on the Board as well as co-chair of the 2003 30th Anniversary Crystal/Lucy Awards. Women In Film has a mentor program, internship program, award-winning PSA program, assists filmmakers with grants, provides scholarships and does a number of advocacy and outreach programs. Prior to her Presidency, she served on the Board of Directors for six years. She was named California Mother of the Year 2000 by the America Mothers, Inc. and was honored at luncheons in Los Angeles and New York. In 2000 Davids also received the Bob Yeager award from the Publicists Guild of America for her humanitarian efforts. In 2002, Hollace served as tehe Corporate Chair for the American Heart Association's 2nd Annual Women's Legacy Luncheon. Sean Fernald has produced several features and documentaries, including "Red Velvet" (2009) (a horror-fantasy film) and is preparing "Top of the Mountain" (2015) (a televangelist believes that God has appeared to him and commanded him to meet him at "the top of the mountain" and await further instruction. He does so, with catastrophic results). As a Music Supervisor, Sean has worked on over 100 features along with various television series, film & video game trailers, advertising spots, corporate branding campaigns and more. Sean has 10+ years of major record label experience with MCA Records, Virgin Records, Capitol Records and Sony Music, specializing in visual marketing, music video (production and promotion) and music licensing and clearance for film, television and other media. Sean is a voting member of N.A.R.A.S. (National Association of Recording Arts and Sciences), the Guild of Music Supervisors and The Television Academy. L. J. Dopp is an associate producer of MARILYN MONROE DECLASSIFIED. Born in Hollywood, CA, this award-winning artist-filmmaker studied acting and directing at L.A.C.C. 's famed theatre department, as well as figure drawing at Cal Arts and screenwriting at AFI. He began professional cartooning at The Los Angeles Free Press during the Watergate era and subsequently ended up on President Nixon's White House enemies list. Published in many newspapers and magazines over the years, he was art director for David F. Friedman's pioneer home video company in the late '70's and held key publishing positions through the '80's, finally becoming a set and prop designer for fantasy films in the '90's. In 2002, Dopp designed and sculpted Dragon Con's Futura Award, based on the robotrix from Metropolis. 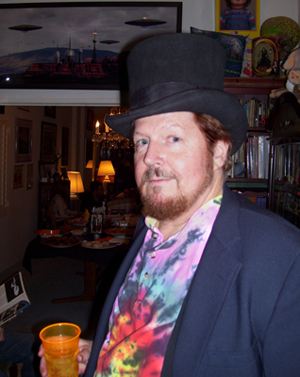 He won a Rondo Awards Honorable Mention for Best Magazine Cover of 2012 for the cover of Mondo Cult #3, and he has done 17 cover paintings for "Vincent Price Presents" comic books so far. His "Blue Forry" portrait, eerily predicting the exact time of Forrest J Ackerman's death on a clock - four years before he passed away - was published in Fate Magazine in 2010 and is the key art for Paul Davids' feature-length documentary THE LIFE AFTER DEATH PROJECT. Writer-director of the 2010 horror parody, CRUSTACEAN, Dopp is also production designer and did the music score, as well as performing those duties on 2012's THE BONEYARD COLLECTION, hosted by Forrest J Ackerman and co-written, produced and directed by Dopp. The film guest-starred George Kennedy, Brad Dourif, Barbara Steele, Tippi Hedren, Candy Clark, Robert Loggia, Kevin McCarthy, Ken Foree, Susan Tyrell, Ronn Moss, William Smith, and Budd Friedman & the Improv, among others. Called “Incredibly Credible” by the San Diego Union-Tribune, Holly Beavon has been a working professional Marilyn Monroe tribute artist her whole adult life; entertaining corporate and private audiences worldwide while also portraying Marilyn in over 60 film and TV projects. Jared Leto declared her work “perfect” in his star-studded long-form music video “City of Angels”. The Lifetime film “Beautiful and Twisted” featuring Holly as Marilyn, premiered in January 2015, followed by two more music videos by International artists, an extended profile in the periodical “Art Decades”, a billboard in San Francisco, and shooting for photographer Phillip Ritchie’s new book, inspired by Bert Stern’s “The Last Sitting”. On July 24, 2015, Adam Sandler’s new Columbia Pictures film “Pixels” will premier, featuring Holly as the voice and mouth of Madonna. Holly’s work has garnered several awards, including the professional tribute artist industry’s “Reel Award”, earned her a place in numerous books, and inspired three recorded songs. She does all of her own voice work, from video games and radio performances to recording with a 32-piece Latin big band orchestra. Holly has a B.A. in Theatre from Indiana University, and thanks to Marilyn, never needed a backup career! She performs in a wide range of acting roles besides Marilyn, but the thousands of jobs and crafting her own hand-made replica costumes and wigs keep every moment filled. She loves her home base in Hollywood, as well as the opportunity to make appearances at the same sort of charities and events that Marilyn herself made, on the same historical streets. “It’s a privilege to carry on a small part of Marilyn’s tradition, her efforts as an early feminist, humanist, and portray her struggle as an icon of femininity.” Holly cares very much about the truth of Marilyn, and hopes this documentary brings insight into the convoluted mystery of her death. Ron James played several roles in creating of elements of the film and its supporting graphics and materials. Ron James founded Ivolve Media Group, Inc., an online television network dedicated to consciousness and personal growth. James is a pioneer in alternative media creation and distribution. James has created and produced over 200 DVDs covering the topics you will find on Ivolve TV. James recenly played key roles in several music productions, including Earth, Wind and Fire on HSN, the 2014 Guns and Roses Movie, "Appetite for Democracy", The Smashing Pumpkins' "Oceania" on Paldium and more. Ron has also won a combined total of 17 national awards for various media arts. He has won Best Picture and People's Choice two out of the last four years in the ET Genre "EBE Awards". He hosts his own show on Ivolve TV, "Bigger Questions", where he and guests explore the potential fusion of science, spirituality and mystery into common human understandings that will shape the future. for exclusive updates and be an "insider!"